Joy to the world! Emory’s December calendar includes plenty of holiday-themed festivities, as well as other exciting musical and dance offerings. Events begin this week as students are invited to come to the First-year Quad on Thursday, Nov. 29, for a holiday experience. The children’s classic film “The Polar Express” will be screened at 7 p.m. and the Student Programming Council will supply blankets and hot chocolate for a cozy experience. Participants can also get into the holiday spirit by decorating ornaments, with supplies provided. This event is part of the campus Table Talk series and is free. Candler School of Theology has several events celebrating the Advent season. The first, the Hanging of the Greens, is Tuesday, Dec. 4, at 11:05 a.m. in Cannon Chapel. A week later, Dec. 11, there will be an Advent service of Carols in the Chapel also at 11:05 a.m. On Thursday, Dec. 6, music for the Advent season, “Magnificat: My Soul Magnifies the Lord” will be presented in Cannon Chapel at 11:05 a.m. and will be live-streamed. 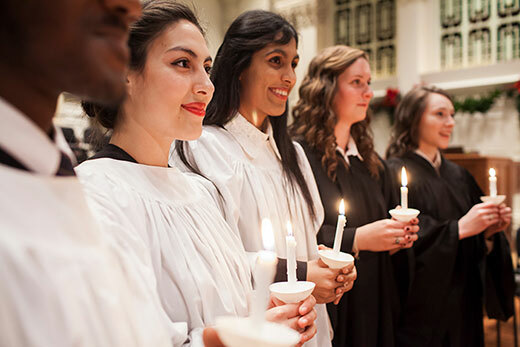 A Festival of Nine Lessons and Carols, an Emory tradition established in 1935, continues with a candlelit service of choral music and scripture readings by special guests from the Emory community. This event will be held on Friday, Dec. 7, and Saturday, Dec. 8, at 8 p.m. and also on Dec. 8 at 4 p.m. in the Glenn Memorial Auditorium. Tickets are $20; Emory students $5. Come celebrate Christmas with the Atlanta Master Chorale as they sing the songs and carols of the season. Performances take place in Emerson Concert Hall on Saturday, Dec. 15, at 8 p.m. and Sunday, Dec. 16, at 4 p.m. Tickets are $35; Emory students $10. Round out your Christmas musical events with ECMSA: Santa’s Favorite Chamber Music on Sunday, Dec. 16, at 4 p.m. The Family Series of the Emory Chamber Music Society of Atlanta welcomes back Santa Claus himself to introduce and enjoy some of his favorite classical works and lead a sing-along. He’ll also bring along some early holiday treats for good listeners. This event will be held in Michael C. Carlos Museum’s Ackerman Hall and is free and open to the public. Emory’s Oxford College gets into the holiday spirit Saturday, Dec. 1, at 4 p.m. as Meridian Herald presents its 26th annual Southern Folk Advent Service at Old Church near the Oxford campus. This year's free service includes bluegrass-gospel music from Leah Calvert and the Dappled Grays; reflections from Brooks Holifield, Charles Howard Candler Professor of American Church History Emeritus at Emory; and Sacred Harp folk hymps from the Meridian Chorale. The Oxford Chorale presents concerts Thursday, Dec. 6, and Friday, Dec. 7, in the chapel on the Oxford College campus. Directed by Maria Orchetto, associate professor of music, performances take place at 8 p.m. both nights; tickets are $5 per person. Emory’s December arts events also include some non-holiday related happenings. Emory University Symphony Orchestra and Emory Wind Ensemble share the stage in a free combined concert on Saturday, Dec. 1, at 8 p.m. in Emerson Concert Hall. During the Carlos Reads Book Club, Louise Pratt, professor of Classics at Emory, leads readers through “An Odyssey: A Father, a Son, and an Epic,” author Daniel Mendelsohn's entwining of personal narrative, literary and personal exploration. Join the book club on Monday, Dec. 3, at 7:30 p.m. in boardroom of the Michael C. Carlos Museum. Registration is required by calling 404-727-6118. Fees are $20 for Carlos Members and $30 for nonmembers; fees include the cost of the book. Take the opportunity to both listen and watch during an evening of Argentine tango music and dance performed by Emory students. This free experience takes place in the Performing Arts Studio next to the Burlington Road Building on Wednesday, Dec. 5, at 8 p.m. The Vega String Quartet welcomes pianist Andrew Bayles and soprano Caitlin Andrews Bayles to perform music by Respighi, Villa-Lobos and more. Hear them play on Friday, Dec. 7, at noon in Ackerman Hall. The concert is free. Finally, Emory Dance partners with CORE Performance Company and The Field in New York to share new work created by Atlanta artists. The 10-week workshop leading up to the showcase provides feedback, support, structure and community for artists in any medium. Watch the Fieldwork Showcase on Sunday, Dec. 9, at 5 p.m. in the Dance Studio of the Schwartz Center for Performing Arts. Tickets are $7.